In recent days Gold has been more oversold than the gold stocks. Entering this week, the gold stocks were fresh off a major technical breakdown. 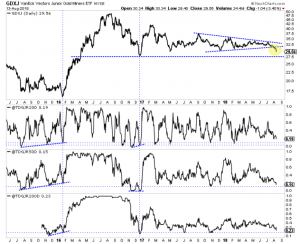 An upside or downside break can lead to a market stretching beyond what typically qualifies as overbought or oversold. After Monday’s selloff, the gold stocks are hitting oversold levels but have more to go before reaching true oversold extremes. 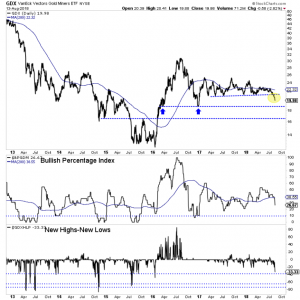 Monday’s decline in the gold stocks has moved the sector into oversold territory. Another day or two of a similar decline would likely put the various breadth indicators into extremely oversold territory. Within the context of a significant technical breakdown and a primary downtrend, one should wait for oversold extremes before turning bullish or covering shorts. We informed subscribers Sunday that we will take profits on our large short positions as GDX and GDXJ approach their December 2016 lows.